Per my post last night that highlighted a $5k+ delta to my $90k debt pay-off goal, there is no rest for the weary, and I have to go find more money if I want to be debt-free by the end of June. I just got done with night one of SAT tutor training/interviewing, and it couldn’t have gone more poorly. To quickly recap the selection process, there is a Skype interview that starts the ball in motion, followed by three three-hour training sessions taking place over three consecutive days. After that, trainees must take the SAT and score 2100, a score which could get a high school junior into a level of schools just below the Ivies. Only 2% of all applicants are hired on to be SAT instructors for the company with which I’m interviewing–HBS’s acceptance rate at ~9% is actually better! The three training sessions simply consist of “teach-backs,” where the “manager of instruction” opens the 300-page curriculum at random, selects a page, chooses a trainee to deliver a three to five-minute lesson, or “teach-back” on it, and gives them 30 seconds to prepare. If the teach-back goes well, the trainee is invited back for the second training session, and if that goes well, for the third. The main call-out from all of these was interaction. Each of the six actual classes is three hours long, and in order to keep highschoolers interested for that long of a time, the trainee must engage the class at a rate of 80/20–the class should be talking 80% of the time, the instructor 20%. This is very similar to the HBS class format which is all about the “case discussion” rather than a lecture format, and the professor utilizes the Socratic Method to get the class discussion heading in the right direction, making sure the students draw the right conclusions from the case study, but draw them on their own. Making this connection, I took solace in the fact that I had experienced top-notch student-led discussions for two years at the West Point of Capitalism, and assumed I would be fine in that regard. That being said, I did not completely relax, and rightfully so, seeing as how I completely crashed and burned during my teach-back. First off, three of the six trainees were actual teachers, so right away they had an advantage over me in the area of boardwork, if not everything else. Second, and this one was my fault, I didn’t prep for the training as well as I could have. Trainees were expected to come into the first training session being intimately familiar with the 300 pages of the curriculum and all ten hours of training videos on the website. I had every intention of prepping thoroughly over the weekend, but I worked on the landscaping business from 10 AM to 4 PM on Saturday, printing flyers, hanging them, and working on Michael’s yard, testing our timing assumptions and ironing out best practices. I also went out with friends that night from 10 PM to 4 AM, got to sleep around 4:30 AM, and woke up at 1 PM on Sunday. Oops. Out of all the stuff I was supposed to do this past weekend–work on the landscaping business, prep for the SAT training, go out with friends, wash my cars, mow my lawn, trim my shrubs, call my parents, go to church, go grocery shopping, and cook my lunches and dinners for the week–I managed to squeeze in grocery shopping, some work on the biz, going out with friends, and stumbling through 150 pages of the SAT curriculum and five hours of videos. So right off the bat, I wasn’t looking good on the mastery front or boardwork front, but I feel that I have a decent personality and I have a lot of energy, and I thought I could do the whole engagement/interaction thing based on my experience at HBS, watching HBS profs in action. The manager of instruction, Ryan, asked me to teach page 18 of the curriculum, which is all about how to employ a three-step strategy for reading through a dense and boring critical reading passage. Several students had already done teach-backs on other topics and received public feedback from Ryan, so between the five evaluation points mentioned above and the customized feedback he gave each trainee, I had a good idea of what he was looking for. Beyond the five key areas, it was also important to create a “hook” that grabs the students, personalizes the upcoming lesson for them, requires their engagement, and pulls them in. When I turned to page 18 to figure it all out, I broke out into a cold sweat. While it seemed that there had been obvious hooks for the three trainees that preceded me, I had nothing! Literally nothing came to my mind. I had absolutely no idea how to make this interesting. I’m fairly good at winging things, and I assumed that I could just wing it–this had to be easier than the kinds of presentations I give and the discussions I’m involved with in meetings with executive directors and VPs of the Fortune 500 tech company where I work. On the other hand, I was sitting right next to the exit, and a part of me really wanted to head out to the parking lot rather than up to the front of the class. I felt the clock ticking, so I got up from my seat, walked to the front of the class, turned around, put page 18 on the desk in front of me, looked out at the trainees and Ryan, then the looking turned into staring, and I stared at them some more, and I waited for the words to come to me. Nothing came. My visions of leading with a crazy hook and being an awesome MC of a super-intriguing discussion rather than a boring instructor of a boring lecture fell apart before my eyes. I had no hook! I still had no freaking hook. I couldn’t believe it. My armpits immediately became geysers, and I could feel my face turn dark red. “Oh my gosh, no way. I’m actually doing far worse than the girl who went second, and she completely bombed this,” was basically all I could think. And then I just started lecturing. I didn’t even acknowledge anybody in the room for the first 120 seconds of my spiel, and I still can’t really remember exactly what I said. I do know that I tried to use some big words to try to compensate for the mess I was making. Finally, realizing I hadn’t engaged anyone worth a darn, I started asking the class completely random questions about the strategy, questions that provided absolutely zero value-add to the lesson. I couldn’t steer the discussion worth a darn by asking follow-up questions, either. I was in a tailspin, grasping at straws, and going down fast. All the trainees’ faces had this pained look of awkward embarrassment on their faces. Nobody could look me in the eyes. Beads of sweat were gathering on my forehead. I eventually pulled out of my tailspin by just letting them do the talking, which didn’t really work since they didn’t know what they were supposed to say, and I finally took them out of their misery by abruptly ending the lesson. To any HBS profs who might have happened across this blog: My goodness. Never, ever, ever let anybody tell you that letting or trying to force a bunch of students do the talking is an easier teaching model than straight-up lecturing. The Socratic Method is chaos wanting and waiting to be unleashed, and only the most adept professors can control it. Bravo to each and every one of you. You had my admiration and respect while I was at HBS, and now you have it ten-fold. The feedback from Ryan and the class was about what I thought it would be–extremely negative. I wanted to hand my curriculum binder to Ryan and drive away in my car, but since Ryan had said some people might give two teach-backs, I figured there might be a slim chance that I could salvage it. Later on, the final two people who had to give a teach-back read through a part of a critical reading passage, each taking a paragraph and leading a class discussion around it. They got feedback from Ryan and the class at the end of their turn, so it became very clear how this was supposed to be done. Ryan called me up to to lead the class in discussion on the third paragraph, and because I had seen it twice–with post-mortem feedback to boot–I managed to emulate the prior two, add some flair, and–not too surprisingly, given all the prep–I actually did fairly well. At the end of the class, Ryan sent us all into a room and called us out one-by-one to tell us in private if we would go to the Tuesday training session. If I had been Ryan, I would have been very split on whether or not to give me a second chance. Thankfully, he did, and he said that for tomorrow’s teach-back, I’ll need to have a very clear action plan on how to attack the lesson I’m given because that’s when I’m a much more effective and confident instructor–not when I try to build the plan on the fly. I couldn’t have agreed with him more. I shook his hand and thanked him for the probation. I’m definitely nervous about tomorrow. The only reason I did well on the second teach-back was because I had a model to follow and build upon. I definitely won’t be so lucky tomorrow, but I don’t have time to prep since I have a full day of work before training. I do want this job. Good SAT performance is important, I want to help kids do well on it, but most importantly, the job pays fairly well at $25/hour. One of the teach-backs in training today was about why the SAT is important and why high-school kids need to take it seriously. That took me way, way back to my days as a 16-year-old. When I was 16, I didn’t have a clue what I wanted to do. I just knew I wanted to go to an Ivy League school and make $100,000/year when I graduated. That was literally a goal of mine, and that was the salary I wanted. My counselor shot that dream down, though, during the one-on-one session that all juniors were required to have with their counselors. I told her about my hopes to go to Harvard or Yale, and she advised me to look elsewhere because “only the cream of the cream of the crop go to schools like Harvard.” I can still remember her name, of course, and the lay-out of her office that I was sitting in when she delivered that tidbit of advice to me. I can even remember the visual I got in my head when she told me that line–a cup of coffee, with a little puddle of cream floating on the surface, and only the really, really white cream in the very center of that puddle was worthy of consideration to a top tier school. I remember being envious of that cream, and wondering why it was so much more special than I.
I ended up not applying to any Ivy League schools and instead went to Michigan. But that moment in the guidance counselor’s office has stayed with me today because that was the first time in my life somebody had ever discouraged me from reaching for my goals. My parents have always told me that everything will work out as long as I do my very best. I should have listened to them, instead of putting my trust in somebody whom I considered a subject matter expert. Could I have made it into any Ivy undergrad? I took some AP classes, graduated 12th out of my class of 453 students, had some decent extra-curriculars, and got a 32 (99th percentile) on the ACT on the first try without a prep course. However, I also got a relatively lousy 1220 (85th percentile) on the SAT on the first try without a prep course, and for east coast schools, the SAT is the critical test. If I had received more positive feedback from my counselor, would I have taken an SAT prep course, scored better, applied to some Ivies, and been accepted? And if I had, where would I be now? I can’t really complain about how life has turned out thus far. It turns out my parents were right. God bless them. 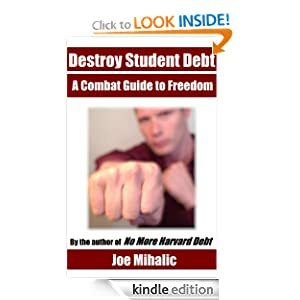 Intense stuff – now go to work tomorrow and sleep under the desk or something….props to you for putting all this out there but it seems like an incredibly intense way to try and reduce the debt. I thought the focus on the landscaping business was supposed to balance out the intensity of the regular day job. Tutoring business seems like its going to just compound the stress. Jim, yes, my stress level these days is at an all-time high. Easily. But I have a $5k delta that’s not going to solve itself. I woud like nothing more than to focus on one thing and do it extremely well, but the bottom line is that I have zero additonal jobs right now that are bringing in extra money to bridge that gap. The landscaping biz has no customers, that’s a huge problem, and Michael and I literally have no idea what to do about that. That’s a bigger problem that I’m going to have to work on. Before I get to it, however, I’m going to take nine hours of SAT training (if I can make it), take the SAT, and then I’ll teach a class three hours a week. Not a huge time commitment, and the landscaping business will still be there for Michael and me to go solve once I’ve completed SAT training. If I can do the SAT training for a guaranteed incremental $2-$3k+ over the next nine months and eek one or two thousand out of the landscaping business, I’ll be happy. I really don’t understand why you are going through Kaplan to tutor. You can make better money tutoring your neighbor’s kids without having to waste time with all this “training”. Once you get one kid to tutor, it is easy to find the next. And you can make way more than $25/hr (remember, that is pre-tax, and they probably employ you as an independent contractor, so you are covering all the taxes, so even less). At very least, I hope you are planning to learn the curriculum, then take that knowledge to tutor on your own, and undercut Kaplan as you don’t have the overhead. Parents pay crazy amounts of $$ for these classes and you are getting paid crap for the work you are doing. Remember, you have to prep, so you are making way less than $25/hr on this based on the actual work you have to do. Easier said than done. If you can show me a parent willing to give a Fortune 50 product line manager with two years of operations management experience and two years of marketing experience $30+/hr to tutor his kid in AP English, calc, history, etc., then I’ll show you a guy who’s willing to tutor the kid. The bottom line is that in this economy, parents know they don’t have to pay a ton of money to get a high-quality tutor who has had actual tutoring experience. I like the idea of stealing the curriculum and striking out on my own, but it sounds unethical, and by golly, I signed my buddy’s and sectionmate’s MBA Oath, so I won’t. It’d be worth a try putting out a Craigslist ad and putting some fliers near schools or even UT Austin. How about instead of tutoring a kid AP Calc, you set a niche for yourself as someone consulting a kid on college admissions? I am sure there are takers out there. other than the whole unethical part, Kaplan had a non-compete provision in their contract (at least when i was teaching for them). of course, the enforceability of that non-compete varies by jurisdiction. to amanda’s point, Kaplan instructors are not classified as independent contractors. but she’s right about the cut they’ll take from tutoring fees. the way i viewed it was that they took care of the marketing and administrative hassle (details that i wasn’t interested in handling) so i could focus on what i loved, the teaching. although, not to beat a dead horse since i left this same remark earlier–if you’re qualified to teach GMAT prep i would swing that way. higher pay. and certain of Kaplan’s competitors pay much more for the GMAT test type. i know folks getting up to $100/hr. i’d give this some thought before you let them lock you up with a non-compete. I’m not qualified–I got 96th percentil, requirement is 99th, and I really don’t know how the heck I got 96th the first time around–took Thurs and Fri off from work, studied eight hours on my own each day, then took the test on Saturday. Really don’t think I should be teaching that to GMAT takers, and pretty sure I just got extremely lucky. Parents only know what you tell them. And they pay tons of money to places like Kaplan for stuff that primarily works (raising test scores) due to statistical variation. Take advantage of the HBS name and their lack of mathematical understanding. I can’t believe your guidance counselor told you that. All of the counselors at my school pretty much expected us to apply to all Ivies or small Christian liberal arts schools. (I went to a private Christian high school). They’re supposed to encourage you do aim high, and then comfort you if you fall short. Sad. Good luck on your tutoring gig, but I agree with other commenters; you could find way better pay tutoring for a private high school or something. Shoot, at Pepperdine in Malibu, CA, tutors are paid anywhere between $40-$80/hr to tutor the kids of rich, high-achieving parents. Shoot, put me in touch with those parents! Craigslist is listing maily $15 gigs, and the tutors are all asking for about $12 to $15. Well, I don’t think Craigslist is the place to find quality clients that will pay well. Think of it; if you need a job done quickly, you turn to Craigslist because you know the demand for a job always exceeds the amount of jobs available, esp in this economy. If you want to be an elite tutor, I would continue going through with Kaplan just to complete the course and say you were trained by them. Then email school counselors for three private schools near you and tell them your background and name drop Kaplan. Then say you wanted to expand and offer tutoring services for kids who needed help in regular classes, not just SAT prep. Additionally, I would consider even teaching a course on how to get into your dream school, since you did that with HBS. At my private high school, parents paid $300+/kid for a month long course that meant once a week for two hours. It covered how to apply for financial aid, crafting an impressive college essay, etc. They offered it over the summer for juniors entering their senior year. My parents thought it sounded exorbitant, since I could technically look up that information myself, but they were by and large in the minority. Successful parents want successful kids. And they are willing to drop a ton of money to ensure their kids are set up for the most successful future they can buy. College is harder and harder to get into, and parents are getting more and more desperate to ensure their kids’ success. I have guidance counselors like that. Because of that, i don’t even like guidance counselors. They just seem to be negative maybe because of their own situation or possibly because of the large number of kids they are responsible for. I went to a private school and my senior class had about 45 people, but I am sure the counselors handled the other high school students as well (which would have been about 150-200 people in total). Yeah, the fact that they’re bitter never even crossed my mind. That had better not be the reason to discourage a kid to follow his dreams. Shame on their unprofessionalism if that really is the driver. Honestly though, was that guidance counselor actually *wrong*? Like you said, your life has gone pretty well so far. And *you listened* to her. Someone who really was set on going to an Ivie, would they have listened to one data point? Also, there are positives to it – look at it this way, you might have had more debt and maybe less fun life experiences if you hadn’t gone to Michigan and went to an Ivie instead. You could have gotten to an Ivie and hated it and asked yourself why no one had suggested other options for you rather than propping up a dream that turned out not to be reality for you at the time (yes, you went to Harvard later, but THAT might have been the time for an Ivie, not undergrad). You never know. It’s no way to live life, to ask what could have been. Only what you can do now. Also, you’ve got balls to put yourself in such a risky situation, have it fail, but not give up. There is no way in hell I would have signed up for such a job in the first place, let alone cling on by my fingernails. Way too intimidating for me. Hey, thanks! The only positive reinforcement–of sorts–in any of the comments regarding my pursuit of this position! Cheers 🙂 I needed your props–I almost let the other guys talk me out of it. Dude, I hear you on the guidance counselor thing. Mine told me that I should only apply to local schools, and Carnegie Mellon would be a stretch. When I got into MIT all I wanted to do was give her a fu, and double that after HBS. Isn’t there a saying where sweet success the best revenge? Mad kudos on the blog, super inspired to do this myself! Guidance counselors can say whatever you want, but strange things happen. Hell, my own mother thought I was crazy to apply to Michigan, let alone Northwestern or any Ivies (I didn’t apply to any Ivies, I’m not that crazy). But, for some reason, they saw something in me and let me in, because it sure as hell wasn’t my test scores or grades. Bottom line is, anyone can say anything, and no matter what they say, we all make the decisions ourselves, regardless of influence. Go after the Kaplan job. If it’s something that puts yourself out there and broadens your experience, why not? The pay might not be great, but it helps your goal and increases your capacity for learning yourself. I know what they saw in you, bro. A person who is going to be absolutely fanatical about whatever profession he goes into and will make it intereseting, you meteorologist, you! Hi there, I don’t know if this blog is now defunct but I just wanted to add my small story here because something in this post struck me. So far I’ve been reading along since the beginning and I’m in a somewhat different situation. First I’ll start with what we have in common. I also got a 32 on the ACT my first try no prep, my SAT was a similar percentile to that on the first go as well. I was always a test baby and really confident of making whatever needed. Unfortunately I hate risk and my parents saved $0 for my college fund. I only applied to schools guaranteeing full rides and here I am 4 years later with 0 debt having just graduated. My school was a top 50 public university and I anticipate a tolerable career path in Houston business. Not sure if you check this still, but this blog has been my obsession these last two days, and I really enjoy reading your personal postgraduate take on finances. No job yet, but unlike you, I’m not trying hard enough. Wunz, the world is your oyster…go and open it.